Richmond, British Columbia, Canada – April 3, 2018 – Corvus Energy is pleased to announce that it has been selected by Stena Line and Callenberg Technology Group to supply the lithium ion-based Energy Storage System (ESS) for the battery-power retrofit of M/V Stena Jutlandica. Stena Line will be the first Swedish ferry operator to operate a ferry with zero emissions while berthing and in port. Stena Jutlandica is a combined passenger and freight ferry—or Ro-Pax ferry—operating between Gothenburg, Sweden and Frederikshavn, Denmark. The project is co-financed by the European Union and Swedish Transport Administration. This initial stage of the retrofit employs plug-in hybrid technology that charges with shore power and draws on battery power for bow thrusters and maneuvering when berthing in port. The ultimate goal is for the Stena Jutlandica to operate fully on battery power, requiring an estimated 50 MWh of stored energy for the 3 hours and 25-minute crossing. Shore power from clean energy sources is also an important focus area. 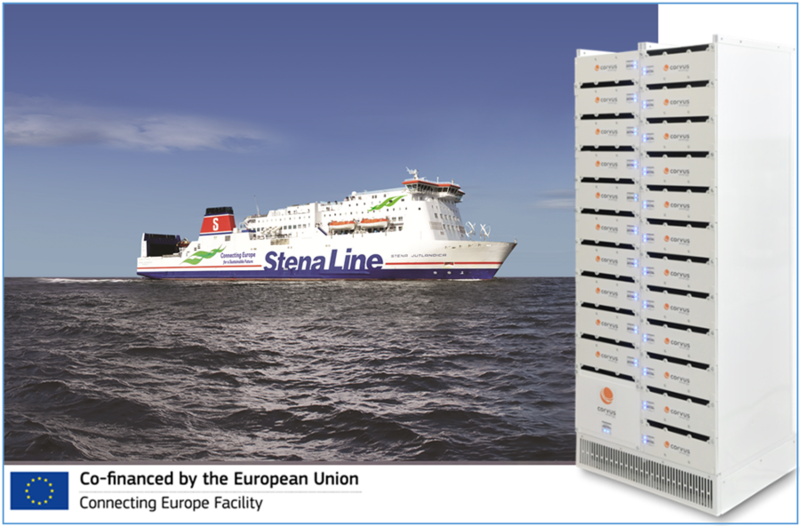 Stena Teknik, Stena’s marine technical solutions branch, is working with electrical system integrator Callenberg, part of Trident Maritime Systems, to incorporate the Corvus Energy 1 MWh capacity Orca Energy™ ESS. “We are impressed with Corvus Energy’s battery technology and the company’s track record in the maritime industry,” says Per-Erik Larsson, Director Sales at Callenberg.